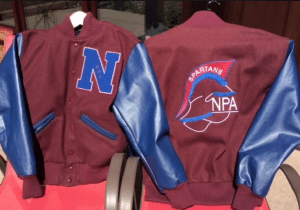 The Community Enrichment Committee – Parent Volunteer Group is gathering orders for NPA Letter Jackets. The fall order due date to get your information, NPA chenille letter, and a check made out to NPA CEC for $200.00 is October 2nd. Download the order form or get one on campus at the front desk in the main building and at Mrs. Kasprzyk’s desk. We will have a couple of sample letter jackets (photo above) on campus today and on Tuesday night at the HS Open House night by the main reception desk in the main building for those wishing to see them in person or check sizing. If you have any questions after looking over the details on the order form, please email npacec@northlandprep.org.